Flint water "much better," independent expert says. 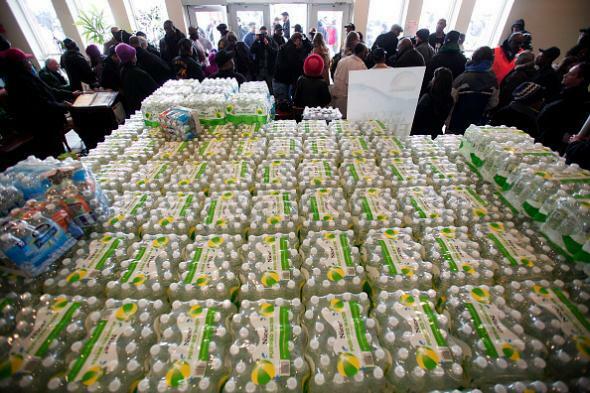 Bottled water at the Metropolitan Baptist Tabernacle Church in Flint, Michigan. Environmental Protection Agency guidelines call for action if lead levels of 15 parts per billion are found in 10 percent or more of a city’s homes that are known to be at high risk of lead contamination. Edwards’ research team, assisted by Flint residents, found lead levels of 15 parts per billion or higher in 16 percent of homes that it sampled last year even though the city of Flint did not have enough data to identify which homes were at high risk. (In other words, an untargeted study found lead levels well over what the EPA would consider dangerous in targeted high-risk areas.) The data released by the state of Michigan this week, by contrast, found levels of 15 ppb in only 7 percent of sampled homes. While that’s an improvement, it doesn’t mean the city is in the clear in re:federal requirements—the process of identifying which homes are at particularly high risk doesn’t appear to be finished yet. Flint’s crisis began when the city began drawing its drinking water from the Flint River in April 2014; the river water was more corrosive than water from the city’s previous source, which caused lead used in plumbing materials to leach into tap water. The city switched back to the less corrosive water source in October 2015, but experts cautioned that the switch would not instantly reduce the amount of lead in the system. In the meantime, various charities and government agencies have been distributing bottled water, filters, and testing kits to residents. Read more in Slate about Flint, Michigan’s drinking water emergency.